A delicately potted porcelain bottle vase, supported on a countersunk base and with a small, flared neck surmounting the globular body. The clay is a mixture of grey and white, which results in delicate, carefully separated, diagonal parallel lines on the sides. The base is engraved with the mark of the maker to one side. The vase is contained within the original tomobako, inscribed Neriage-tsubo, Kosei, with the seal Kosei (vase crafted by neriage method, Kosei). The artist Matsui Kosei (1927 – 2003) was designated as a Living National Treasure in 1993. 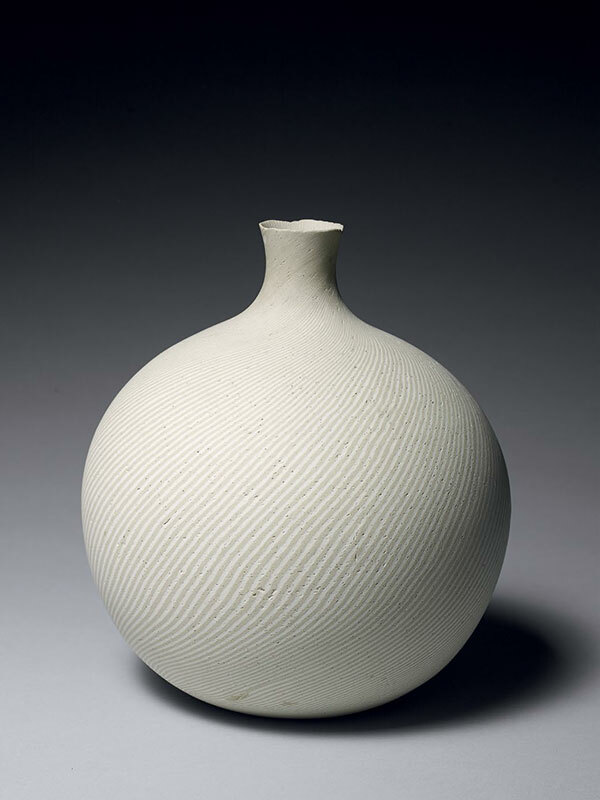 Matsui Kosei was hugely influential in the revival of so-called neriage ware, made using a time-consuming technique, whereby different coloured clays are mixed, rolled out, cut and reassembled. He studied numerous examples of ancient Chinese and Korean ceramics when he was a priest at the Getsusoji Temple in Kasama, Ibaraki Prefecture. An example of his Neriage ware, a stoneware jar made from marbled clay, is in the collection of the Victoria and Albert Museum, London.